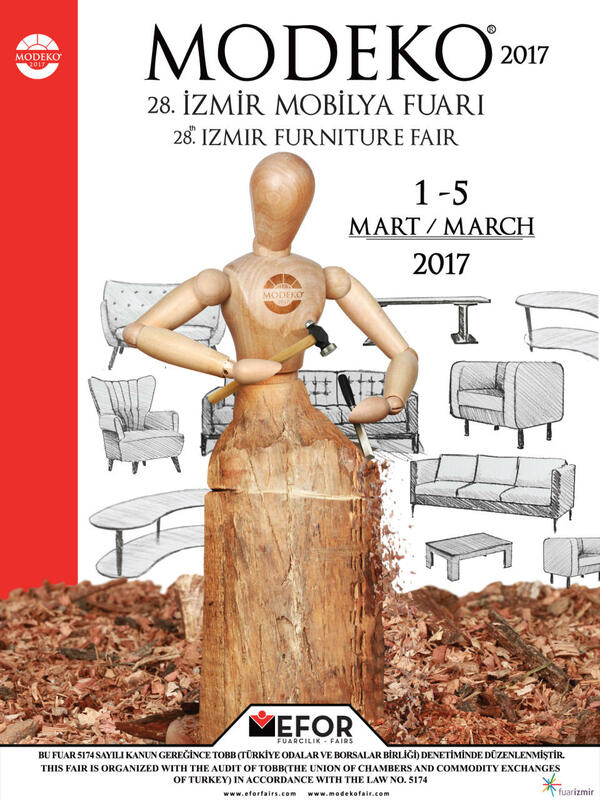 MODEKO Izmir Furniture Fair, one of the biggest events of the furniture industry, is counting days. The fair, which will start with a magnificent ceremony on March 1, 2017, will host the sector's stakeholders for 5 days at the largest exhibition complex of Turkey; Fair Izmir. Mrs. Nuray Eyigele, General Manager of Efor Fair, pointed out that the last point reached by 300 exhibitors in quality and design will be shown to thousands of local and foreign sector professionals. She emphasized that they will host the representatives of the 50countries designated as target markets in a special program. The most comprehensive organization of Turkey in the sector MODEKO Izmir Furniture Fair, will be opened for the 28th time in Fair İzmir, Turkey's largest exhibition complex. The new brand and model works of the participants are going on fast for the fair that will take place between March 1 and 5, 2017. There will be more than 300 companies and distinguished domestic and international brands from different sectors. The participants will exhibit Classical and modern furniture, Antique and modular furniture, Tables, chairs, sofas and armchairs, Baby and young people rooms, beds and bed sets, Office furniture, Kitchen furniture, Garden furniture, Home decoration and accessories, Lighting equipment group products and services. It is estimated that the interest for the Fair, which powerful brands will exhibit their new models for the first time, will be big. Mrs. Nuray Eyigele, General Manager of Efor Fair, drawing attention to the fact that the furniture production increased by 10 times in the last 10 years together with developing technology, said that the producers have increased their market shares with the vision of MODEKO and opened up to new markets. Emphasizing that the 28th exhibition platform will provide great advantages for the visitors as well as the participants, Mrs. Isleyen said that the models of the leading brands of Turkish furniture production, which have achieved export success to 175 different countries last year, can be seen in Izmir for the first time and the price advantages can be captured in this fair. "The future vision of the furniture sector in Turkey will be revealed once again at MODEKO 28th Izmir Furniture Fair. In the world ranking, the sector that focuses on entering among the top 5 exporters of furniture will reach the target market at MODEKO. We aim to have approximately 30,000 people from 50 different countries visit our organization last year, where approximately 25,000 visitors from 32 different countries are interested. We continue our work in this direction ". Place designations for MODEKO 28th Izmir Furniture Fair continue at a fast pace with promotions. Considering the allocations up to now, 41% of the participants are Classic, Modern, Avangard and Modular Furniture Manufacturers. followed this, there are table, chair and sitting group producers with 22%, and beds, sofa and side product producers with 17%. The fifth is the Office and Garden Furniture Manufacturers and the sixth is the Children and Young Room Furniture Manufacturers. The organization supported by the Ministry of Economy, Izmir Metropolitan Municipality, KOSGEB, Izmir Chamber of Crafts and Artisans Chamber, Izmir Chamber of Commerce, Aegean Region Chamber of Industry, Aegean Exporters Unions, Karabaglar Municipality, Izmir Furniture and Carpenter's Chamber, Wooden Works Industrial Engineers Association, and by the leading organizations, local and foreign purchase committees were invited to the fair.